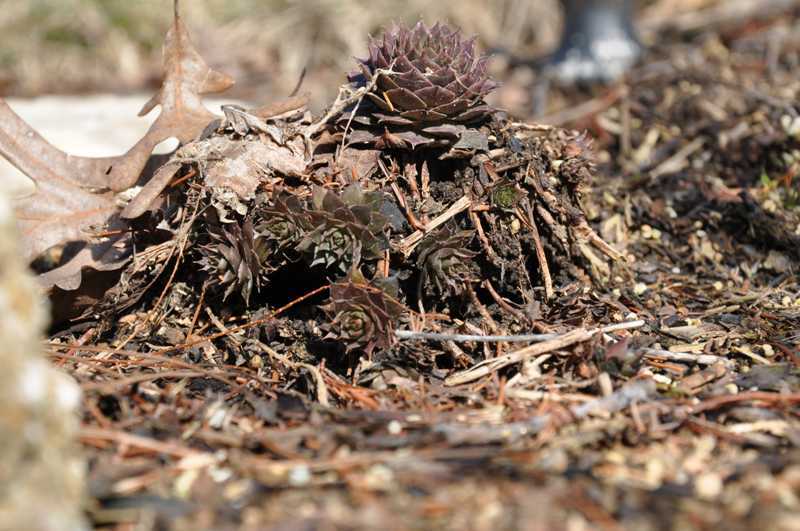 Frost heaving can cause plants to rise up out of the ground as these hens and chicks (Sempervivum) did. 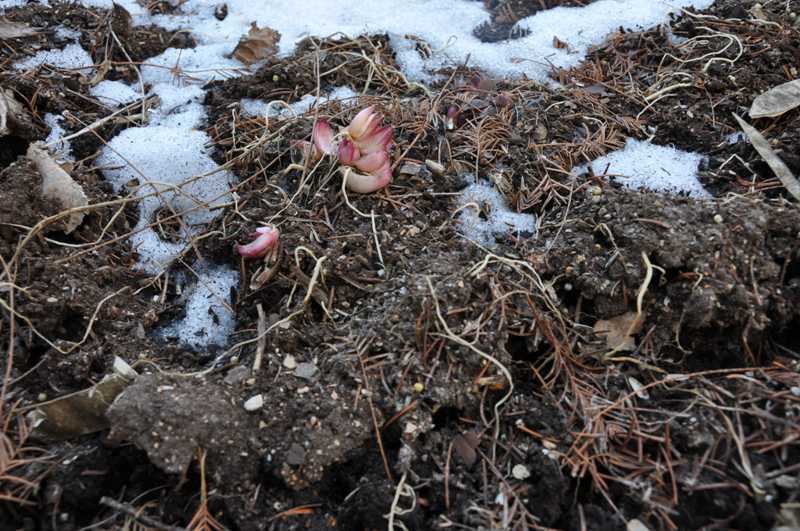 Cold-hardy perennials can be damaged by winter weather. Frost heaving is the usual culprit. Wide temperature fluctuations, with repeated cycles of freezing and thawing, cause the water in the soil to expand and contract. These repeated expansions and contractions push and turn plants and their roots. The result is heaving of the crowns. They are pushed up out of the soil breaking some roots and exposing other roots above soil level. The elevated crowns and roots are exposed to cold temperatures and drying winds. They may be seriously damaged, stunted or killed. Perennials with shallow root systems (strawberries, heuchera, scabiosa, leucanthemum, galliardia, bergenia) or those that have been planted recently and have not had time to establish adequate root systems are prone to frost heaving. 1. Controlling frost heaving starts with well drained planting beds. Both surface and subsurface drainage is essential to prevent water from pooling in planted beds. Soggy ground will freeze and thaw repeatedly and susceptible plants will heave. The addition of organic material when the beds are prepared helps loosen soil and promotes good soil drainage. 2. Plant early in the fall. Planting perennials at least 6 weeks before the first autumn frost date gives the plants time to establish adequate root systems to anchor themselves. 3. Mulch. Mulching with organic material (compost, ground leaves, straw, or pine needles) will help moderate soil temperatures reducing heaving of root systems. The mulch should be applied after a hard frost, and at a depth of 4 inches. Excess mulch can lead to soggy ground and rodent infestations. Avoid burying the plant’s crown as the mulch is put down. 4. Monitor the plants. Keep a careful eye on susceptible plants. The mulch can hide an exposed, heaved crown. When a problem is found, cover the exposed roots with a layer of soil and re-apply mulch.